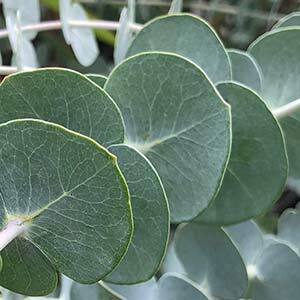 A common name that aptly describes Eucalyptus pulverulenta is simply the Silver Leafed Mountain Gum. It is also known as the Silver Dollar Gum and it is grown as a foliage plant. It does come from alpine areas and it does have very attractive silvery green foliage, and it is the juvenile foliage that is the most attractive. The cultivar ‘Baby Blue’ was actually found in California and is a smaller growing Eucalyptus than the species itself. In cultivation the plant can be pruned back to encourage more juvenile foliage. This foliage is another that is is demand by florists for backing in flower arrangements. The Florists Silver Dollar is the name given. The leaves are actually a juvenile form, and as E. pulverulenta tends not to want to produce the adult leaves the attractive foliage lasts longer than on some other species. Flowering commences in winter and continues through to summer. The flowers themselves are a pale yellow to cream, followed by largish fruits. To maintain a smaller bushy shrub, and encourage new foliage many gardeners coppice E. pulverulenta every few years. Coppicing is simply the practice of cutting the plant right back to ground level and this is a species that responds well. When planting out, ensure that the soil is well drained and that you choose a reasonably sunny position. Water through the first summer, after that E. pulverulenta is reasonably drought tolerant. Fertiliser is not usually required, you can use a little native plant fertiliser in particularly poor soils if required. Botanical Name – Eucalyptus pulverulenta. Height – Dependant on climate to around 6 metres.